Hello Dear Readers! After a busy few weeks, I am back! I’ve got a slew of updates for you, but they’ll have to wait for another week or so when….Brian and I will be back in the wonderful US of A. I plan to catch up on the backlog of posts (and kick the job search into high gear) lakeside at Brian’s house. So in the meantime, here are two reasons why our return home comes not a moment too soon! 1. 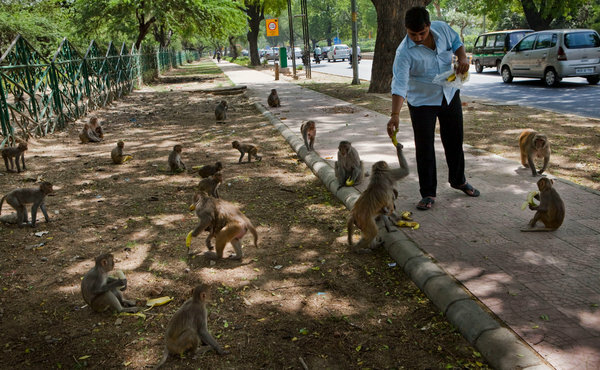 “Fed by Indians, Monkeys Overwhelm Delhi.” (NY Times) Rise of the Planet of the Apes fo’ real. 2. Delhi is an oven. 3. Brian’s hair is threatening to go to seed. …my washing machine sings to me after the laundry is done. After trekking from Kalaw, we were rewarded with our arrival in Inle Lake. Brian and I expected Inle to be a wide open waterway with homes surrounding in. Instead we discovered Venice if you picked it up, plopped it into a watery Asian fairytale. (And Venice is storybook-worthy itself, so imagine just how otherworldly Inle feels!) Inle is home to the famous fishermen who use triangular nets and paddle with their feet instead of their hands. Instead of sowing seeds in the sedentary earth, Inle dwellers farm floating gardens, rafts of soil and peat that grow crops abundantly. Artisans spin yarn by hand from lotus flowers, instead of the expected cotton or flax. Floating markets travel from place to place on the lake. Stupas grace the shoreline, as people in flat-bottom canoes paddle by silently. Each new sight felt like a discovery on Inle Lake. For our one full day on Inle Lake, we hired a guide to tour us around in his flat-bottomed canoe, the primary mode of transportation on the lake. Armed with hats and umbrellas to fend off the sun, we set out to discover the lake. We visited the Floating Gardens and bounced on them for good measure….. The long poles keep the gardens from floating away! Brian and Chuck looking snazzy, while floating on the floating gardens. Spinning lotus fibers straight from the stalk. Crazy! A rainbow of naturally dyed lotus scarves. Women making cheroots (long thin green cigars). So pretty and wayyy inexpensive. The lake glowed at sunset. We watched the world go by from our boat. Houses on stilts, the vernacular architecture. A flat-bottom canoe, the local mode of transportation. At the end of the day, we returned to our lovely hotel and our own personal traditional abode, perched over the water. In the morning when we woke, light reflected off the lake below and into our hut where it shimmered on the bamboo walls. Many of the other tourists we met in Myanmar are ethnically Burmese foreigners, returning to Burma for the first time in their lives, now that the junta is slowly liberalizing and Aung Sung Su Kyi has lifted her tourism boycott. Jeffrey, who we met at our hotel, is an American, whose father was apparently a high-ranking politician in the early years after Burmese independence. His father recently passed away, leaving to Jeffrey his mansion, the last standing on what was once Mansion Row, in Yangon. Today the father’s family still lives in the rambling home, which is crumbling down, a relic of more prosperous days. Jeffrey invited us over to see the home as well as his father’s collection of books. We met his family, and his half-sister Su Ky was so kind to present me with a gift of a traditional longyi and showed me how to tie it. It’s quite ingenious — just a cloth tube that you fold and tuck in — and comfortable, too! The highlight of the trip was our trek from Kalaw to Inle Lake. After two days of riding a train that chugged across dry plains and up jungle-covered mountains, we reached the town of Kalaw, a small mountain retreat, where we met our guide Zani. According to Zani, whose English was pretty good, it would take three four-hour days of trekking to reach the lake, a famed oasis in central Burma. Perfect. However, we had a hotel reservation in Inle Lake two days later that we didn’t want to miss, and since our train had been delayed (slash we heard that the train was either two hours, four hours, five hours, or seven hours, depending on who we asked), we needed to make up some time. Ever-resourceful Zani managed to round up a battalion of seven motorcycles and drivers within an hour. Brian, Chuck, Mark, and I clambered on the back of the motorcycles, left our bulging backpacks in the hands of the passenger-less riders, and donned helmets that looked like WWII reproductions. Hanging onto our bikes and/or drivers, we rode through the Shan Hills as they glowed in the last hours of daylight, and we spent our first night in the home of the village chief (who gave no indication of his status). Badass Chuck in transit. Note the camo helmet. The next day, we began our trek in earnest. Starting out at 8am, we headed out with our porters in the lead. (We had read in the Lonely Planet that you can get your luggage driven to each stop on your trek. However, Zani was apparently not aware of this option. Rather he hired a few guys to carry our backpacks during the three day trek, which became more humbling and impressive with every step….they were wearing flip-flops.) We walked through the most thriving pastoral landscape I have ever encountered. In America, the vastness of farmland gives it an anonymous quality, as though the fields had spontaneously been sown without the intervention of a human hand. But the agriculture of the Shan Hills is almost intimate. Families and communities tend by hand their plots of land, each parcel small enough to see its boundaries. We didn’t witness a single piece of machinery in use, but rather bullocks pulling tills through the soil and men and women bent over with their hands in the soil. These were pastoral scenes out of a painting, though peaceful images that belied a life of hard work. Brian likened this terrain to Tuscany a hundred years ago. Fragrant, just-dug ginger. Oh my gosh, it smelled good. Our trek took us through many villages of the Pa-O people, where they welcomed us with smiles, tea, and bowls of peanuts. In one village, an older woman sat weaving on a backstrap loom, and in another a man wove baskets from bamboo. People live in beautiful two story homes, built from bamboo, wood, palm, and other natural materials. They eat rice pounded in their own kitchens. They cook in pots sitting on flames. They keep cows and chickens in their backyards. In the villages, there was no electricity, and only candles lit up the rooms where we listened to our trekking guides talk into the night while we fell asleep exhausted on our floor mats. Weaving a basket from bamboo strips. Crops drying in the sun. Daw Win's house where we spent the night in her peaceful, welcoming village. After almost a month of traveling in places where the internet is spotty at best and completely unavailable at worst, we’re back in the land of connectivity. Our withdrawal symptoms are starting to subside, and we’ve got a lot of catching up to do! So where did Brian and I go for our mystery trip?…. When Aung San Suu Kyi lifted of her tourism boycott of Burma (Myanmar), travelers like Brian and I felt that we could in good conscience visit this mysterious country at an historic juncture of perhaps unprecedented national optimism. Whereas nine months ago, people were too terrified to even mention Aung San Suu Kyi’s name, today posters and t-shirts emblazoned with her face are sold on the streets of Yangon. Living in India, so close to Burma, and knowing that the country may change dramatically in the coming years, Brian and I couldn’t resist the temptation to visit. When our plane landed in Burma, we felt that we were being let in on a secret. While Yangon is in fact a bustling, clean, and relatively modern city, outside its boundary the country is frozen in time. There are few opportunities in life to explore what feels like an undiscovered land, a place where comparatively few outsiders have been in recent times and a landscape that has been little touched by modern life. This is the experience we had in Burma. Trekking through the countryside, the only hint of the 21st century is corrugated tin roofs on palm-sided huts. Farmers driving their bullock carts and women digging up crops by hand dot verdant hills. In houses standing on stilts over a murky lake, women spin thread from lotus fibers, and rafts of gardens float outside their windows on the water. In a wide expanse of the plains that stretches all the way to the horizon, thousands of Buddhist pagodas sprout up, seemingly organically from the ground. At every remote train station, people smile and wave, curious and eager to befriend out-of-place travellers. The sun sets and the moon rises as fiery red balls of light. Burma felt almost like a mythical land, and the sense of discovery that always accompanies travel was magnified ten fold, both because of Burma’s seclusion from the outside world and a magic the country has kept hold of. I could narrate pages and pages to try to convey the travel experiences we shared with our companions Chuck and Mark, friends from the U.S., but I’m going to let the (annotated) pictures we took tell the story. Shwedagon Pagoda is the star attraction of Yangon. Celebrating its 2600 year anniversary this year, the pagoda stands guard over the city, sparkling gold in the sun during the day and illuminated by the glow of yellow fluorescent lights at night. The complex of temples within the pagoda’s pavilion is enormous, and we spent hours exploring. A friendly young monk offered to give us a tour, and he explained fascinating history and religious significance of what we were seeing. A few highlights: the stupa and its regular renovation is funded by donations of the faithful. If you look through the binoculars, you can see that the umbrella at the top of the stupa is decorated with rings and other jewelry, given in obeisance of the Buddha. The stupa is topped by a SEVENTY-SIX CARAT diamond (gasp), and if you stand in just the right spot at the pagoda, you can see the diamond glint blue, red, and green. Everyday an army of women walk through the pagoda, sweeping to keep the well-trafficked religious site in pristine condition. A little seemed rather confused by the whole process. Changing our money was one of the strangest experiences we had in Burma, and one that gave a small indication of the lunacy of the junta. Burma deals only in kyat, the local currency, and U.S. dollar bills. And not just any dollar bills. Perfectly pristine, uncirculated bills – preferably Benjamins. If you try to hand a hotel cashier, a fruit vendor, a waiter, anyone a US bill that has a microscopic tear, a worn out face, a wallet crease, even a smudge, he or she will politely hand back the bill and say “I’m sorry Madam, but I cannot accept this.” This becomes problematic when you want to spend money. Brian and I had a mixed bag of bills, some crisper than others. So to ensure that we would be able to change enough bills to get us through our trip, I laundered money in our hotel room – literally. I soaked the bills in the sink and then ironed them to give them that fresh-from-the-treasury feel. The official moneychanger headquarters is 50’x50’ store that is ringed by six or so different bank kiosks. Each kiosk has a bevy of people responsible for judging each and every bill you present. Luckily, ironing our bills had crisped some of them up enough to pass the scrutinizing eyes of the moneychangers. Some kiosks took our hundreds for the going exchange rate of 812 kyat, some took our fifties for a reduced rate, some took our twenties for an even further reduced rate, etc. The old, wrinkly one dollar bills didn’t pass the beauty test. We spent a large portion of our time in Burma traveling from one place to another this was an excellent way to see the countryside. We spent a fair amount of time on trains with wooden benches and open windows that let the breeze, crossing the rice paddies, blow through. We chugged across scorching plains and up through wooded hills. We stopped at remote village train stations, where women would come to the train windows hawking watermelon, steamed corn, rice with dried fish before the train whistle blew and we began to slowly pick up steam. During one of these journeys, Brian and I sparked a friendship with a young boy in the preceding train car who waved and smiled at us as the train rolled along. Finally, at one of the station stops, the boy’s grandmother came to our window and presented us with a gift – a bag of watermelon slices and wide smile. We reciprocated, walking up to the boy and his grandmother’s train car and presenting them with the only thing we really could offer that might appeal: an energy bar. While we rode trains and in a van (whose air conditioning we thought was broken so we baked for eight hours before realizing our driver didn’t realize we were hot and the air conditioning worked perfectly well), the primary mode of transportation in Burma is bullock cart. We must have seen hundreds of them while we were there.